IMHO you and your camera have done well with a high contrast subject. The shadows are long for 2pm and the risk was blown highlights or black shadows. You have neither, and have produced a pleasant picture. Thank you for the kind words. Since this building faces East, and when I can be assured of a clear sunrise, which we haven't had many of recently, I plan to use the warm early light to capture a few more images of it and post a couple here. The choice of aperture (f/stop) has very little to do with any perceived underexposure, lack do shadow detail or bluish color cast in the gray barn wood. I suspect it is a simple matter of "subject failure" which oftentimes occurs in back-lighted objects or scenes. The cameras metering and auto white balance system "sees" the sky and the bright colors and highly reflective elements in the surrounding areas and adjusts for those thereby rendering the darker tones a bit muddy. I don't think there's all over underexposure or that you have gone beyond the dynamic range of the system. I did not refer to the metadata but simply downloaded one of the images- seems all the necessary informant is there and just require a bit of post processing tweaking- nothing extreme. The shaded area are illuminate by the open shade blue skylight and therefor tend to go a bit blue or colder. So...I dodge a bit and warm up the image and pumped a bit of blue into the sky- because it when greenish whe I added yellow. When you are shoot theses kinds of structure, you might consider allow the came to take a spot reading of the neutral gray wood and use it a a "gray card" lock in the exposure and white balance and the back up or zoom out for the shot. Bracketing exposure also helps. In term of color balance and issue of warm, neutral or neutral tones- that's up to you. Unless you are after exact color matching to the actual scene, it is a matter of taste. Also temperature change with the time of day adn weather conditions. "Daylight" can go from 3100 Kelvins to 12,000! If the camera "thinks" it's 5500K you are gonna run int strange results, so you may want to set custom color balances depending on the conditions. Personally, I don't always go by or refer to metadata, histograms and color targets unless I am doing a commercial job that requires color matching. In landscape and othere artistic endeavors, that stuff can drive you nuts. And...just lie fine custom printing used to be the key to great color prints back in the olden-film days, a little post-processing is not a dirty word. Shift you color palette to fit the mood. "tu es l'atist" excuse my French (you da artist) so play with the colors, saturation, contrast and set the mood. 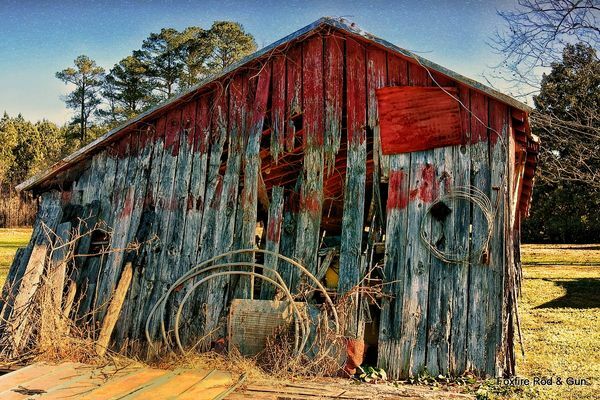 So...I love old barns and dilapidated rural buildings. If I had my way, I would live in one but my lovely wife (neat-nick that she is) would object! Therefore, I took the liberty of messing with one of your shots. Go put in you PhotoShop program or wahtever and make a big print and hang it on your wall- Nice shot! There is nothing wrong with technical excellence, precision and accuracy in imagery. I just feel that ofttimes photographer become so preoccupied with many finite technical issue that the do so at the expense of creativity, self expression and uniqueness in their photographs. For a shot time, I studied photography at an art college- they threw me out after they discovered I coud not draw, paint to sculpt. There was one professor there, however, that I wanted to learn from so I hung in for a semester. He would complain that "y'all are making too many "picture post cards". He would patrol the "life" classes and remark "those are breasts- sonny, not water-wings"! He encourage what we now call "jumping out of the box" and looking for textures, subtleties, different points of view, doing exercises and experimentation in different areas and not necessarily just always producing perfect finsihed work. So...here I am, many decade later, doing commercial work and producing catalog and website images, kinda like picture post cards. Then, I run into so may photograph here and in person that want lenses that can "see the bacteria on someones face" and spend so much time looking at their histograms that the are kinda neglecting their subjects. I also do a good volume of portraiture and so many of my lovely lady subjects (clients) are not interested in seeing their pores in a head-shot- let alone the germs! Some of my best work is done with old beaten up lenses that have more aberrations than a psychopath. Of course, all good photographers should understand the rudiments of exposure and image management, perspective, color space, tonality , dynamic range all that good stuff but on a beautiful sunny day, or in a moody haze, or wahtever. While out and about doing landscapes or still life, or casual portraits, or whatever strikes their fancy, sometimes the old f/16 rule or the data on those little pieces of paper that came packaged with the film would suffice so we can concentrate on the mood, the theme, the textures, the expressions and the body language and the ambience. Thanks for your input, suggestions, and tips. I meant to respond to this much earlier but overlooked doing so. I like what you did to the image that you tweaked. I have discovered several other interesting buildings that I plan to capture as soon as it warms up a bit. That's one advantage of living in a rural environment, with farming on the down turn, there are many of these buildings being totally left to rot & fall down. I have film images of a number of these that were once here but now gone. Thanks again.